I decided to limit the number of posts I put out, thinking that perhaps the people who read them had reached overload with the dark and hopeless situations I photograph. It was never meant to be ‘pretty’ but reading the blogs of other photographers who fill their ‘space’ with joy, hope and beauty I was beginning to feel like the boisterous, drunken neighbor who has gatecrashed a Brady Bunch family BBQ. That does not mean I have stopped photographing the streets of New York City just that I have been keeping the images to myself. Then I came across this man. At 51st and Lexington he trotted up and down the entrances to the Subway. Down the stairs, up the other side, across the road, down the stairs, up the other side, across the road …. An endless, circular, pointless march. A path that made me think of the behavior some captive caged animals display when ‘stir crazy’ kicks in through being deprived of their natural environment. So I followed him, now there were two of us rising above and falling below the streets of NYC. He always avoided eye contact with anyone who stood in his way and waited patiently, almost apologetically, giving them the right of way until he could continue the quest that only he could understand. Blank faced and dead eyed. His skin looked burnt, like a charred pepper, it was years of accumulated filth and grime ingrained from sleeping in the doorways and back alleys of the city. I can only imagine his story, the road he has traveled that brings him to this point in his life, I have a feeling that just scanning the highlights of it would give most of us a few sleepless nights . I love (‘love’ is probably the wrong word, I hope you know what I mean) the body shape in this image. So tired and weary, his head tilted down depicts total desolation and despair for me. A hopelessness that mirrors his awkward limbs and the tight grip on the handrail that stops him falling, although I fear that falling is something close to familiar in his world. I left him to continue his compulsive journey wondering at what point he gives up and moves somewhere else, if indeed he does. This could be it, the perpetual circle he travels every waking moment of every day. I will look for him the next time I pass this way. I guess I will never lose the amazement I find in the sheer volume of people living on the streets here. They are not hard to find and I never set out with the purpose of photographing them. They are everywhere, like moth-eaten clothes pegged out on a frayed rope, alone and exposed to whatever the elements throw at them. 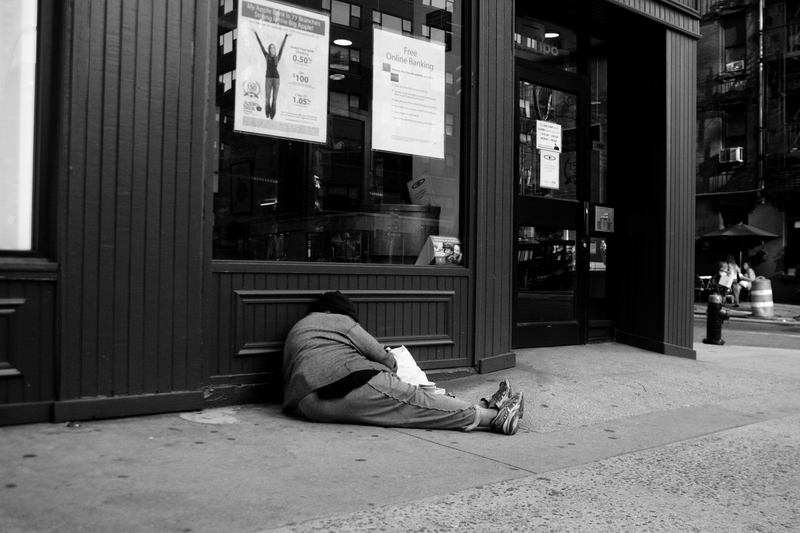 It strikes me as I am writing this that I rarely see groups of homeless people together. Apart from lines at hostels and soup kitchens they are almost always alone! I suppose that begging in two’s or three’s is obviously a non starter, the trauma of being surrounded by a group of homeless people shaking cups at them would make most people run for their lives. But not all homeless people spend their day begging. 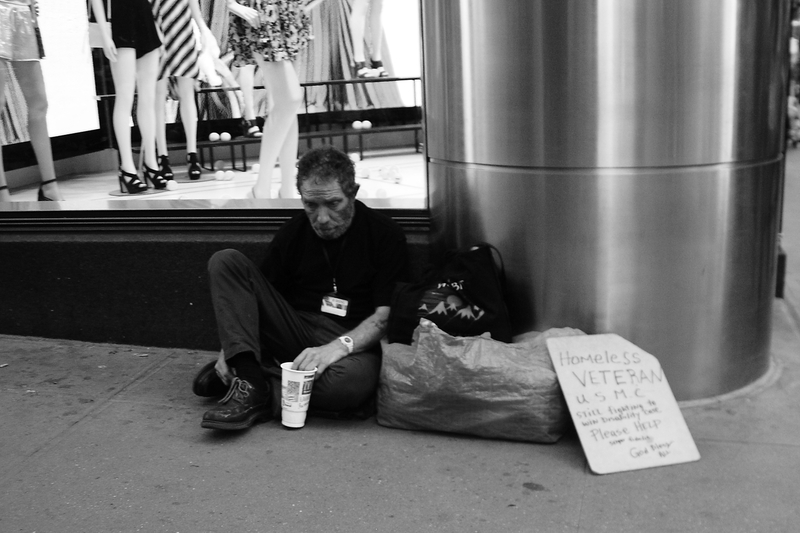 The man above did not once ask any passerby for anything, nor did any of the good people of New York he came across offer a few dollars without being asked, despite the obvious horror of his situation and why should they. I did (I’m not looking for a round of applause here) and he took it and nodded without looking up. Below are some other images taken on the same day. Your work is very important – whilst there is light in this world there is also dark and it should not be ignored. I admire your photography very much and believe that it is the role of the photographer to capture all of life, not just the pretty. Thanks, I believe that too! 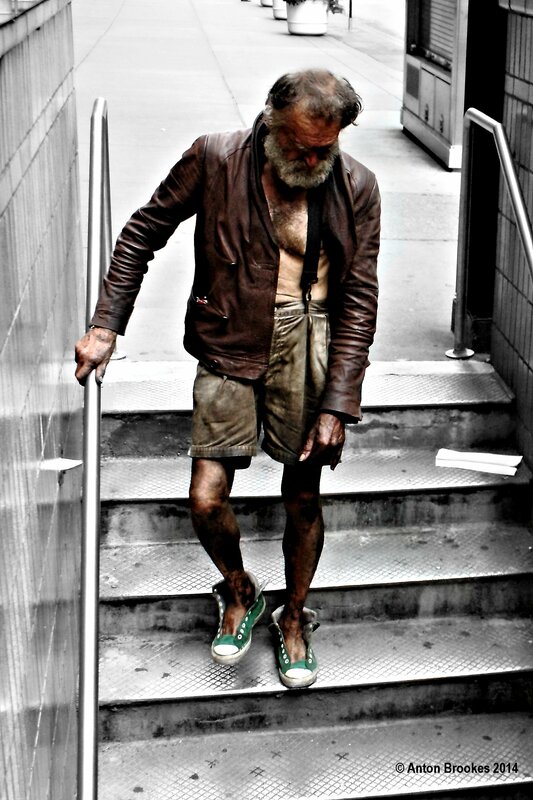 And so do I – I also photograph the homeless whom I do not see as wasters. Anton, I have to tell you how much I love your homeless pictures which should be taken and seen. New York is not all cupcakes and cocktails. From my limited experience with the homeless here most are not at all happy with the shelter system, while others struggle to get into the shelter system. I honestly don’t know what the solution is but I am always more than happy to give them money and if they buy booze, cigarettes, coffee with it, I don’t care. All I know is the money is going straight to the needy without having to pay admin costs. You don’t need me to tell you to keep up the good work, whether you post it here or not! Thanks Patti, I think that I if were in the position of some of the people I photograph a trip to the liquor shop would be the first thing I would think of doing with a ‘donation’ Thank you for your continuing support. Totally with you on this one. We give money and once it has left us we no longer have a say on what it is used for. Comfort has to be found where it can be found – I do not judge. I totally agree with the top comment! people need to see what life is really like for some people. you show the emotion in your photography, it tells a true story! People tend to pick and choose what they see, even if it is standing right in front of them. Thanks for the comment. It’s frustrating and heartbreaking to see these images, but it can’t begin to compare to what these folks are living through. What will it take for this wealthy nation to face up to this problem. The answer can’t be in the police tactics used to break up the protest in Detroit, or other places. If there were no dark we would never understand or appreciate light Gunta. But I understand what you say, sadly, the world seems to get darker by the day. Another great thought provoking series. I couldn’t agree more with the previous comments and want to say that I have missed the more regular posts. Thank you, I just thought we all needed a rest from the doom and gloom on the streets of NYC. I know that I did, I was beginning to feel a bit burnt out with it all to be honest. Anyway, more to come. This is an extract from my soon to be released book “Sacrifice”. I couldn’t get into America because I couldn’t find it. This great land of technological advancement, leadership and consumerism lacked soul. I felt the tendrils of a society in decay. 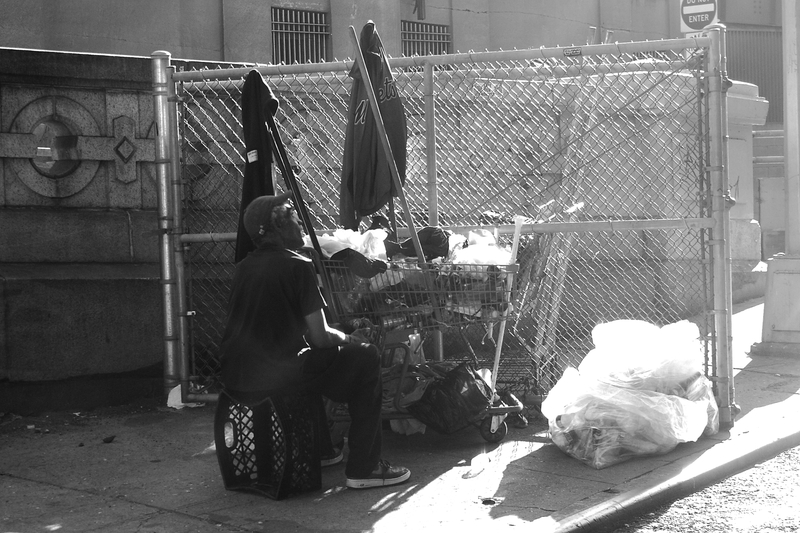 A land of ‘haves’ and ‘have-nots.’ On every corner sat a beggar, if not two or three. The ‘haves’ chose to completely ignore the ‘have-nots’ as if they were lowly pigeons or worse, pieces of litter. I gave regularly to the beggars, particularly the ones who approached me. They would only ask for a quarter. When I gave them a dollar it became quite apparent that they did not receive this sort of generosity often. It was almost a shaming experience to say the least, because giving a measly dollar did not make me feel terribly generous in the light of their situation. But it was the plight of their desperate situation that touched me so deeply. These folk were ordinary people, sometimes women as young as thirty, with signs propped at their feet reading: “Please help, eight-year-old son to support.” Often the men had signs hung around their necks made crudely from cardboard and rope, reading simply :“Vietnam Veteran,” which seemed to explain their plight in two words. It didn’t matter what the reasons were, whether they were drug addicts and had brought their doom upon themselves, deserted wives, alcoholics, or war heroes, they seemed to me victims of a rapidly decaying society that no one wanted to claim responsibility for. They were ignored by the masses as surely as the litter and grime they lived among. Had I not seen this twenty years ago, or were my baby eyes not yet open enough to see? Were there more beggars now than back then, or was I just too caught up in my own Utopia, too blind to see the real world going on around me? When I enquired more about the plight of these poor souls, it got worse. These people were unemployable, therefore they were unable to contribute to a social security pension plan and could therefore never expect to receive a humble pension in their old age. Not that many of them would ever expect or probably even want to reach a ripe old age. There were not enough shelters for these homeless people, no hot meals, no soft beds, and no kind words, so most were condemned to the streets. I found the most appalling aspect was that the American government seemed to be doing nothing about its homeless people. My token dollars, or other tourists sympathetic contributions, which fell into the hands of a lucky few, ultimately would not change their situations. Only the government could give dignity back to these people by helping them. America, the richest nation on Earth, but rich in what? In my view, it was certainly not compassion. Anyway, that was the soap box on which I stood. PS: you are one of the only bloggers I follow, love your work! Barbara, I am staggered, what a wonderful piece of writing. You paint the thoughts and images that sit at the back of my mind, remarkable. I hope you will contact me when your work is released and let me know where I can read it. Thank you so much for the ‘PS’ I am humbled and genuinely honored by what you said. I too, would love to read more. Images like yours are important and need to be shared to create awareness among the general population (of those living in poverty and homelessness). It’s a reminder to be thankful for what we have – the food, the warmth of a home and a general caring and love of family and friends. Even a good education is fast becoming a luxury (instead of a ‘right’). Thanks Vicki, we should always keep in mind that there are many people who would gladly exchange their lives with ours given the chance. What you do is important. So long as you can bear to shoot the photos, I hope you continue to do so. Thank you Cynthia, I can bear to keep shooting them as long as you can bear to keep looking at them! Less is more Anton in these painful times but its great that you are still documenting these people’s lives. Yes they are painful to view but very important for the world to see. I see them as lost souls who need protecting and as a society we’ve lost the ability to do that. Thanks Tanya, I appreciate your support. Really thought provoking work. In a city where you can easily speed past the disenfranchised you get us to stop and look. Thanks, the human race is not without a few spectacular crashes, trying to maneuver through the chicanes and come out unscathed is the difficult bit. There is no shame in enjoying the trappings of a successful life, the shame is in ignoring the stragglers and pretending they don’t exist. I know that you do not ignore them and obviously have a strong social conscience. Much to your credit. Thank you for taking the time to comment. Anton, I’ve always wanted more from you, dislike the waiting between your postings. Your photos touch me. Barbra, your words match Anton’s photos. Years ago I was told two things that I try to do, look them in the eye even if I have to encourage them. It’s what makes them feel human. Most people will not do that and the homeless notice. It made sense to me when a homeless man at McDonalds told me that. Second, I often carry socks and will give them with a few dollars. Socks are a treasure for most street people. Nice new clean thick socks. 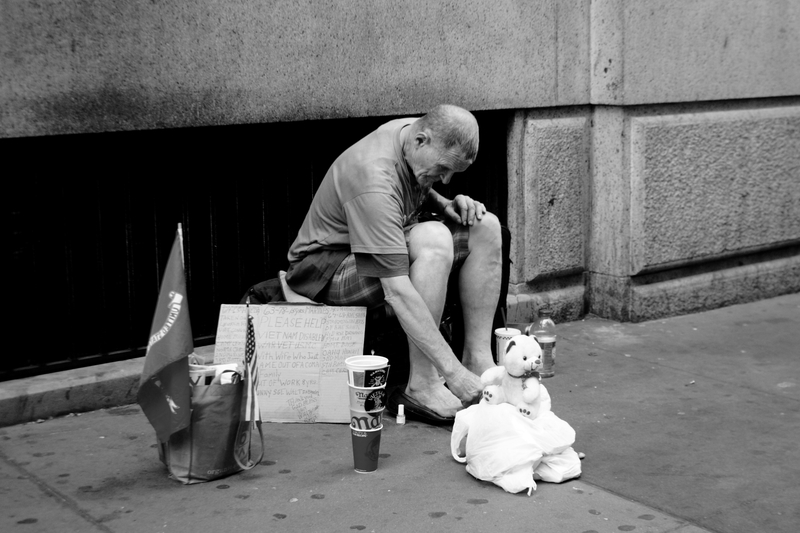 You are right, it is not always about giving money, some comforts that the majority of us take for granted can make a huge change to a homeless persons life. All power to you and thanks for the comment.